Besides some amazing looking graphics, these helmets are actually some of the best on the market. They are lighter, offer better protection, and they are durable. Check out some of the reviews of cool welding helmets below to help you select your new badass welding helmet! 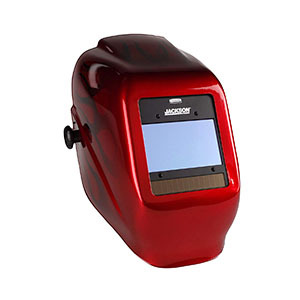 Save Phace Venom Welding Helmet 3.74" x 1.38" 2 Years $ Check Amazon for Best Price! Metal Man Silver Flame Welding Helmet 3.78". x 2.05" 2 Years $$ Check Amazon for Best Price! 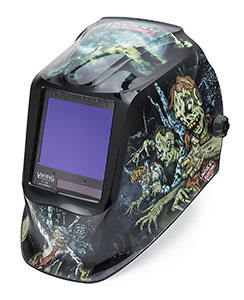 Lincoln 3350 Zombie Welding Helmet 4.74" x 3.34" 3 Years $$$ Check Amazon for Best Price! 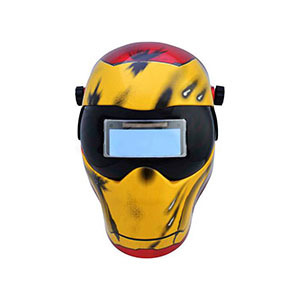 Save Phace I Series Iron Man Welding Helmet 2 Years $$ Check Amazon for Best Price! 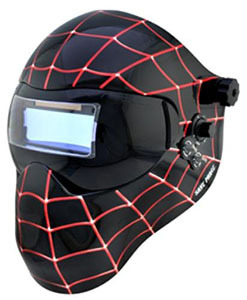 Save Phace E Series Spiderman Welding Helmet 3.74" x 1.38" 2 Years $ Check Amazon for Best Price! Jackson Insight Flame Welding Helmet 3.93" x 2.36" 5 Years $$ Check Amazon for Best Price! 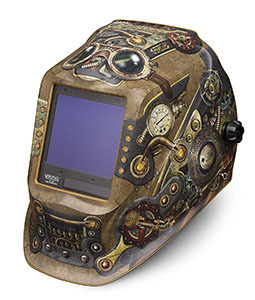 Lincoln Viking 3350 Steampunk Welding Helmet 3.74" x 3.34" 3 Years $$$ Check Amazon for Best Price! 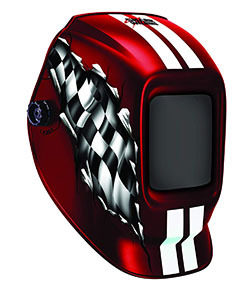 Shark 14264 Red Racing Welding Helmet 3.74" x 3.34" $ Check Amazon for Best Price! It has 23 square inches of viewing area. This creates a complete vision field and eliminates the peering-through-a-tiny-hole in the fence feel. According to Amazon, it is the world’s first adjustable ADF built into a 180 designed lens. Its overall dimensions are 10 x 9 x 12 inches. It is a big helmet, but it weighs only 16 ounces. That might seem inconsequential, but lighter helmets reduce neck and back fatigue. The padding inside creates a comfortable fit. The front shape is slender and conforms more to the human face. This makes it much more suitable for getting into tighter places for up-close maneuvering. This helmet has external shade settings control and adjustable light to dark times in the .1-.9 seconds range. It comes with a filtering shade that darkens automatically. The shade range is 4/0-13. That means the shade default is 4 when darkening mode is not activated. Its high-heat, molded nylon construction makes it durable, and its auto dimming feature is responsive even to shop lighting. It also has a solar cell power supply with replaceable battery. It is an EFP welding helmet. Radical graphics is a big departure from the bland, flat colors of other helmets. It comes with a carrying bag, and it has interchangeable parts. It meets or exceeds ANSI industry standards. It can also be used for different kinds of welding. It has roughly four inches by two inches of viewing area for a total of just under eight inches. This is a more than sufficient field of view. It weighs 1.8 pounds, and its dimensions are 12 x 12 x 12 inches. This size makes it more suitable for larger head sizes. This helmet has five-way adjustable fitting. This many adjustments lets the wearer make it fit to the shape and size of the head. A well-fitting helmet does not feel as heavy or cumbersome. It has a shade control range of 9 to 13 plus grind mode. Grind mode keeps the lens from darkening as the sparks fly during grinding. It has four arc sensors and auto off and on.This helmet has shade 16 UV protection. The Metal Man comes with a limited 2-year warranty. Its solid one-piece molded construction makes it very durable. A removable and washable headband makes it cleaner to use. It is compatible with magnifying lens if needed, and it is ANSI compliant. The viewing area measures 4.74 x 3.34 inches for over 12 inches full color viewing area. That is the largest viewing area of any helmet in its class. This size greatly increases the welder’s view of his work. It also features light sensitivity adjustment. Lincoln’s 4C (color, clarity, carat, cut) technology makes it versatile. It also gives the welder a much clearer view of his work. It weighs a little more than three pounds. It comes with a carry bag, bandana and all the lenses and carrying space for them. The Lincoln Zombie has adjustable straps for that just right personal fit and the padding makes it a comfortable work helmet. It has continuous light control that responds and adjusts as light varies. Shade control is variable. Dark to light delay is almost instantaneous at .1 to 1.0. The color feature reduces the bright, green tints, and you get pretty much even shade at various angles. Lincoln is the Cadillac of the welding industry, and they are known for their durability and worksite toughness. The Electric Zombie has a 3-year warranty. 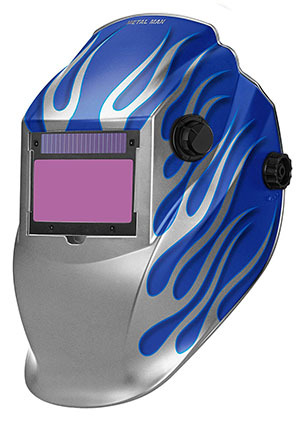 This helmet has a TIG amp rating of greater than 2 amps in both, AC and DC. Its lens adjustment speed is one twenty-five thousandth of a second, instantaneous to the human eye. This helmet offers a 180 degree total view. It too is classified as a 1/1/1/1 clarity level. Its dimensions are10 x 9 x 12 inches, and it weighs around two pounds. This helmet has an adjustable, 2 x 4 ADF and shade 4/9-13. The 180 degree design affords maximum views. The Iron Man offers a 2-year warranty. It has a low battery warning indicator. You can replace lenses and use it for a grinding splash guard or as a grinding mask. It’s an EFP I series helmet. An optional clear lens is also included. It has solar power supply with replaceable batteries. This helmet also has shade adjustments. Power controls are automatic. The viewing area for this helmet is 3.74 x 1.38 inches and 180 degree vision field. It weighs just under three pounds. The Spiderman has a molded, lightweight design. It fits contours of facial features for tighter, more natural fit. It features hard hat compatibility and has adjustable fit. As with any helmet, these shade settings allow the welder to manipulate the amount of darkness he needs to protect his eyes. All the helmets reviewed here have this adjustment as an automatic feature. The full range is 1 to 14. One is close to natural light. 14 is the darkest setting. A protective outer lens extends lens life. This model comes with a limited 24 months parts warranty. This helmet has two arc sensors. Every welding helmet should have a large viewing area with sharp clarity. These two essential requirements have a direct impact on the quality of any weld. This helmet has a huge 3.93 x 2.36 viewing area. It also has the standard delay and sensitivity adjustments. It weighs just 6 ounces. That feels practically weightless on your head. It is extremely light weight and amazing flexibility. This flexibility increases its durability. Its welding shade range is 9-13, and with sensitivity and delay functions. It also has one ten thousandth switching speed from lighter to darker views. The Jackson has a two-year lens warranty. It has separate grind and weld mode LED indicator lights. This Lincoln has a 3.74 x 3.34 viewing area with 1/1/1/1 clarity that 4C lens technology delivers. Light weight under three pounds. Comes with bag, bandana and lenses. It has pivot control which dramatically increases comfort. Continuous light sensitive control, big viewing area and auto-control add greatly to its usability. Shade settings range is 5 through 13. The shade control in grind mode is 3.5. It comes with a 3-year warranty and extra battery life. The viewing area is a whopping 3.74 x 3.34, almost 13 inches. Over a foot of view area is more than sufficient. Clarity is at 1/1/1/1 through enhanced color recognition. Again, 4-C Technology not only gives you a clear picture, but it shows you more of it. Total measurements are 8.2 x 8.5 x 14 inches, and it weighs just 1.55 pounds. It is adjustable and fits better than the old, stiff, inflexible helmets. It is hard hat adaptable. It has continuously variable shade range. This helmet comes with a 3-year warranty. It has four arc sensors instead of two. Two inside and five outside extra lenses are included. A Foose bandana and decal sheet are also part of the package. As you can see from this very brief list of outstanding features, these Badass Welding Helmets and Badass Welding Hoods not only look great, they are outstanding improvements over the old, bland, cumbersome designs. 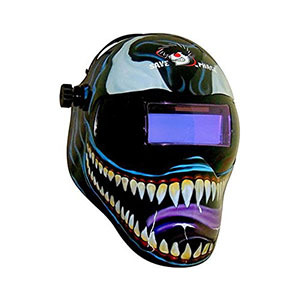 So, if you are looking for Badass Welding Helmets or Badass Welding Hoods, check these out first. These are not only crazy welding helmets, and cool welding helmets, they are also awesome welding helmets. Pick one out today.